Driver technology: an area that could send a NASA engineer into orbit, much less the average golfer just looking for 10 more yards on his tee ball. 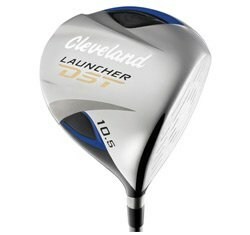 Cleveland golf makes another entry into this market with the Cleveland Launcher DST Driver. This driver features what Cleveland calls "MaxCOR Face Technology," a play on the Co-efficient of Restitution (COR) terminology so closely regulated by the USGA in recent years. Basically, the COR is a measure of the rebound or energy transfer when a flexible object (the ball) is struck or strikes a hard object (the club). With the advent of even larger drivers and faces, it was discovered there is a "trampoline effect" to the ball coming off a large, thin face. This effect was sending the ball into heretofore unheard-of zip codes for many golfers, and some control had to be set. So now, manufacturers are trying to maximize results within the legal parameters. With the MaxCOR Face Technology, Cleveland has created a variable face thickness to enhance the trampoline effect on off-center hits. In addition, they have removed weight from the face and positioned it further back in the clubhead for straighter drives. Finally, this driver falls into the UltraLite category (less than 300g) and is lighter than standard drivers. All of this is designed to produce faster clubhead speed and greater overall distance. All the technology in the world will only help you so much, however, and you still have to swing the club. But hey, if you can buy a little help, why not? Unlike many of the oversized drivers on the market today that look more like a brick stuck on the end of a stick, Cleveland tends to stay with the more traditional "teardrop" shape. While the performance can only be measured by the individual, the visual effect is much more pleasing than most other large driver heads. Available in right hand orientation only, there are several combinations of shaft flex and loft available (Senior, Regular, and Stiff) and lofts of 9, 10.5, and 12 degrees. The shaft -- the Mitsubishi Red 44 Graphite -- is another lightweight component and is in keeping with the overall design and target of this club.